Teads Video, Mobile, Native, Banner advertising network details. 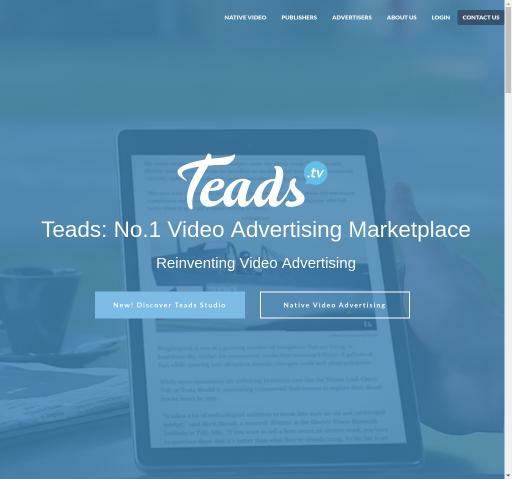 Teads is the advertising leader specialized in Video Ads, founded in 2011 as a native video advertising platform. They offer multiple products for Advertisers and Publishers, such as Native Video Ads available for all devices types, inRead ads, and a self-serve innovative platform. For Publishers, Teads has an editorial content monetization program where publishers from all around the globe can monetize their content. Advertisers get to share their campaigns with the world’s top publishers. If you have any questions before registering in the Teads Network, reach the Information section for additional details. Once you create an account, you will get a dedicated Manager to help you reach your desired revenues with Teads.